ii. Akhaura-Agartala rail project is about 12 km long of which 5.5 km would be laid in India while 6.5 km would be in Bangladesh. The total cost of the project would be about 960 crore rupees. i. The first ever mid-air refuelling of the indigenously developed light combat aircraft Tejas was successfully carried out, placing India in an elite group of countries having air-to-air refuelling capacity for military planes. ii. The mid-air re-fuelling of wet contact trial for Light Combat Aircraft, LCA Tejas MK-1 was successfully carried out from an Indian Air Force base. The Air-to-Air refuelling capability for Tejas is a force multiplier for the Indian Air Force, giving the aircraft the potential to stay airborne for much longer periods of time. · Nirmala Sitharaman is the present Defence Minister of India. · Birender Singh Dhanoa is the present Chief of Air Staff of Indian Air Force. i. With concerns being raised on some proposals of the draft e-commerce policy, the government has set up a group of secretaries to look into the issues. The group will be chaired by the secretary in the Department of Industrial Policy and Promotion (DIPP). ii. The other members of the group include secretaries of the ministry of electronics and information technology and department of commerce. · Dr Vijay Pingale is the Private Secretary of Department of Industrial Policy and Promotion. · DIPP was established in 1995.
i. Minister of State (Independent Charge) for Housing and Urban Affairs, Hardeep Singh Puri inaugurated the first regional workshop on RERA (Real Estate (Regulation and Development) Act) in Pune. ii. Mr Puri delivered the inaugural address at the “First Regional Workshop on RERA – a New Era of Transparency and Accountability in Real Estate – 2 years of implementation and way forward (Western Region)” in Pune. · Maharashtra is one of the first states to implement the provision of RERA. · It has also established the Real Estate Regulatory Authority of Maharashtra, which is popularly known as MahaRERA. i. BIMSTEC Military Exercise (MILEX-18), the first edition of Military Field Training Exercise for the Bay of Bengal Initiative for Multi-Sectoral Technical and Economic Cooperation (BIMSTEC) nations, started at Aundh in Pune. ii. The aim of MILEX-18 is to practice the BIMSTEC Nations in planning and conduct of counter-terrorist operations. Participating countries are Armies of India, Bangladesh, Bhutan, Sri Lanka, Myanmar and Thailand. Nepal is not taking part in MILEX-18. 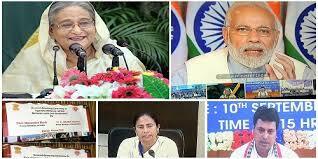 · The BIMSTEC was formed in 1997 and it brings together Bangladesh, Bhutan, India, Nepal, Sri Lanka, Myanmar and Thailand. · The grouping accounts for 22% of the global population. · Sri Lanka is the current chair of BIMSTEC. i. The first of its kind university in the country in the transport sector, the National Rail and Transportation Institute (NRTI), started operations. Currently, it is functioning out of the National Academy of Indian Railways, Vadodara. ii. Funded by the ministry of railways, with University of California, Berkeley and Cornell University as its international partners, the university started with two undergraduate courses - BSc Transportation Technology and BBA Transportation Managements- with 50 students each. i. Best-selling author Preeti Shenoy announced the launch of her new book, 'The Rule Breakers'. The book claims to explore complex themes of women's equality, gender, and inclusion among others. ii. The novel set in the '90s is the story of Veda, who harbours big dreams, but finds herself trapped in an arranged marriage and realizes that her opinions in real life don't matter. i. The Ministry of Health and Family Welfare has announced the implementation of the Human Immunodeficiency Virus (HIV) and Acquired Immune Deficiency Syndrome (AIDS) (Prevention and Control) Act, 2017. According to the law, every HIV infected or affected person below the age of 18 has the right to live in a shared household and enjoy its facilities. ii. The act criminalises any kind of discrimination against people suffering from AIDS in terms of treatment, employment and workplace. Those violating the act could be jailed for up to two years or fined up to Rs1 lakh or both. · JP Nadda is the present Health and Family Welfare Minister of India. i. The 12 days long Indo-Mongolia joint exercise Nomadic Elephant-2018, commenced at Mongolian Armed Forces (MAF) Five Hills Training Area, Ulaanbaatar, Mongolia with a brief opening ceremony. ii. Exercise Nomadic Elephant is an annual, bilateral exercise since 2006 which is designed to strengthen the partnership between the Indian Army and Mongolian Armed Forces. · Mongolia Capital: Ulaanbaatar, Currency: Mongolian togrog. i. India’s ace sprinter Hima Das was appointed as Sports Ambassador of Assam to inspire budding players of northeastern state to aim big and young generation to take up sports seriously. ii. Assam Chief Minister Sarbananda Sonowal has earlier confirmed that Indian Athlete Hima Das will be named as the first sports ambassador of the state. The announcement came after Hima Das recently became the first Indian woman to win gold at IAAF World U-20 Athletics Championships. · Assam CM: Sarbananda Sonowal, Governor: Jagdish Mukhi. i. Justice Om Prakash Mishra has been sworn in as new Chief Justice of Nepal. The President Bidya Devi Bhandari administered the oath of office and secrecy to Justice Mishra in Kathmandu. ii. Parliamentary Hearing Committee (PHC) unanimously endorsed his name for Chief Justice of the Supreme Court. Justice Mishra was appointed as a justice of the Supreme Court in 2014. · Bidya Devi Bhandari is the current President of Nepal and commander in chief of Nepalese Army. · Kathmandu is the capital city of Nepal. i. In a move aimed at creating a payments acceptance network for unorganized retail including small merchants and Kirana stores where consumers can make payments, India Post Payments Bank (IPPB) has partnered with Financial Software and Systems (FSS). ii. FSS a payments technology company to ensure that micro-merchants are able to accept payments over any channel – online, unified payments interface (UPI), quick-response (QR) codes, Aadhaar and IPPB accounts. · IPPB has been incorporated as a public sector company under the Department of Posts with 100% government equity and is governed by the Reserve Bank of India. · Suresh Kumar Sethi is the Managing Director & CEO of IPPB.